What started as a community of town homes nearly ten years ago has morphed into a four-building, 185-unit apartment development on the edge of downtown. Keeping the original name DuCharme Place, architects McIntosh Poris Associates and long-time Detroit developer Walter Cohen have secured financing to start construction this fall. A late 2015 opening is expected. DuCharme Place is located at 1544 E. Lafayette St., across from the Lafayette Foods grocery store. The team began planning DuCharme Place in 2004. The original town home design was scratched, however, when the housing market dropped out during the recent recession. The team revisited the development in 2012, this time with a completely new design. By incorporating heavy landscaping into the development, Michael Poris, architect and principal at McIntosh Poris Associates, says the team is giving a nod to the neighboring Lafayette Park community and its emphasis on green space that resulted from the collaboration between famed architect Mies van der Rohe, landscape architect Alfred Caldwell, and urban planner Ludwig Hilberseimer. The four apartment buildings surround a common courtyard and pool. The buildings are spread across three platforms raised one story above a ground level parking facility of over 200 spaces, which runs underneath the complex. 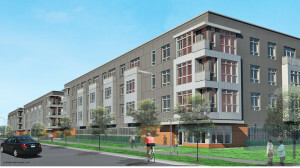 As for the apartments themselves, they’ll be 185 market-rate studio, one bedroom, and two bedroom units. Energy efficiency and a living roof are part of the plans, as well. Architects McIntosh Poris and developer Walter Cohen are also working together on the current redevelopment of the old Detroit Fire Department Headquarters. Redevelopment plans for the historic building include the 100-room Foundation Hotel and a restaurant. The Detroit City Council recently approved a nearly $5 million Detroit Brownfield Redevelopment Authority brownfield tax increment incentive plan for the DuCharme Place development.